Optical systems for controlling the quality and conformity of the products guarantee valuable savings in productivity. They also lead directly to satisfying the specialised demands of your customers. With an experience in several industries, Visio Ing Consult offers you solutions customised to your demands. Visio Ing Consult integrates a turnkey system for product quality control and compliance checks in production lines by means of optical and sensors systems. We integrate the optical control system into the existing production line. We implement turnkey conveyor systems with a control device. Who uses Visio Ing Consult ? In the two branches of the company, thanks to our «turnkey» solutions, adapted to each case, the products correspond to the specifications. 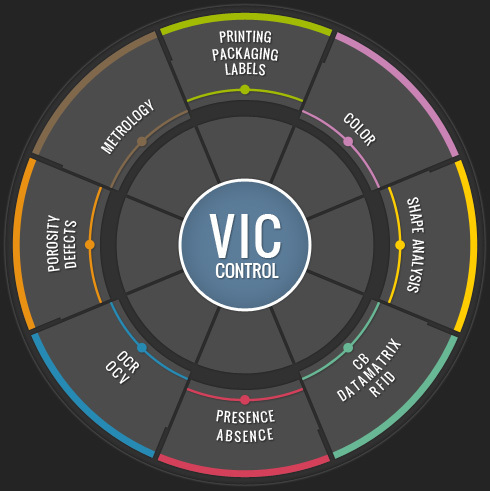 VIC-CONTROL® : its interface and logic have been implemented on the basis of specific requests from the industry. Flexible and multifunctional this product ensures the most reliable made to measure quality and conformity control system. Fom our experiences and concrete problems in the field, Visio Ing Consult designed and developed this high-performance software which can be applied effectively to your own configuration. Don’t hesitate to contact us for a personalised offer, targeted to your precise needs.